I can see the end of the warp! Finishing is in sight. And then, my daughter phones, “Mom! I’m headed to the hospital. This baby is ready!” Weaving suddenly becomes far less important… That was two weeks ago, and little Ari was born. Now, back at the loom, I’ll cross the finish line on this linen upholstery fabric before the day is over. End of warp is seen on the back tie-on bar as it makes its final round on the warp beam. 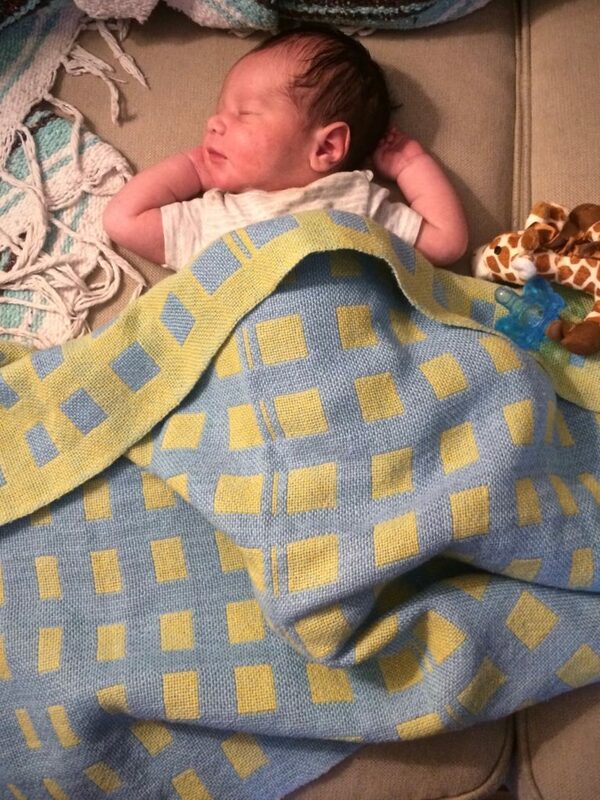 Double weave cotton baby blanket covers baby Ari as he peacefully sleeps. When the back tie-on bar becomes visible, it’s the beginning of the end. And then, the moment the back tie-on bar comes over the back beam I celebrate. It’s the final stretch! Lease sticks are untied and removed after the back tie-on bar comes over the back beam. 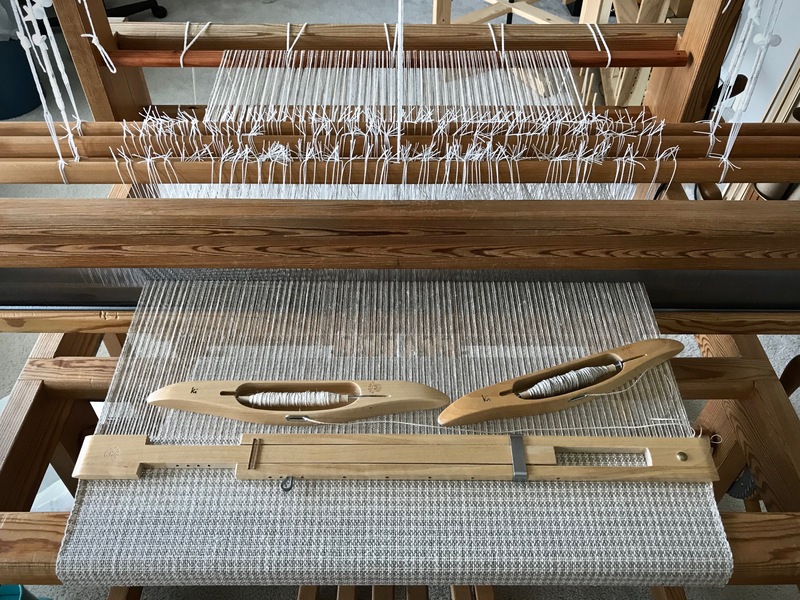 Two pairs of lease sticks were used with this striped warp. We are participants in a great mystery! Christ in us. For those unfamiliar with the tools and methods of handweaving, it’s a mystery how threads can become cloth. But the handweaver knows. The great mystery of God is that Christ may dwell in us. For those who receive him, the peace of Christ rules within. His presence is woven in. 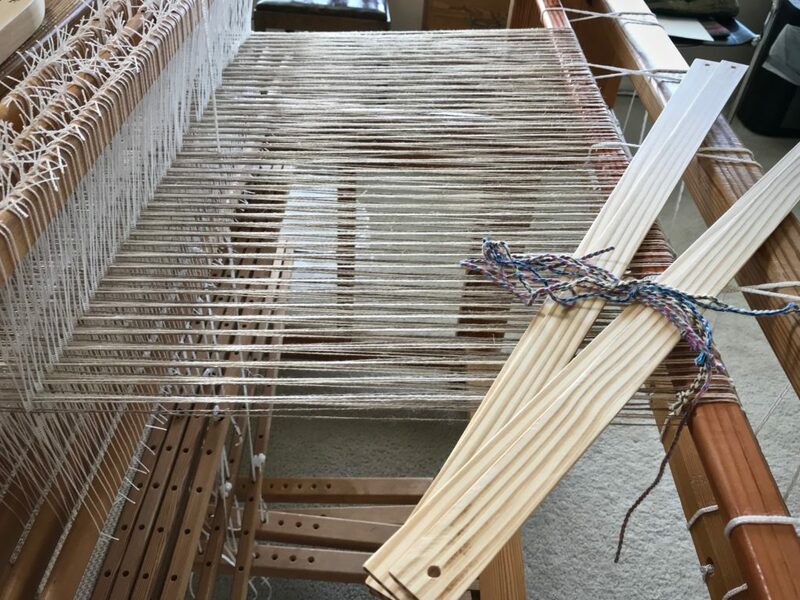 Short distance left to finish weaving this linen fabric. The anticipation of finished cloth is nothing in relation to the anticipation of a new baby in the family. Imagine the anticipation of our holy Father to see the glorious threads of Christ woven in us. May you participate in the mystery. Beautiful weaving, beautiful baby, beautiful Savior! Hi Linda, Heartfelt thanks! Beautiful Savior gives it all meaning. Thank you for your blog. I love reading it each day with my breakfast. What a beautiful baby. Congratulations. You double weave blanket is lovely. What yarn did you use if I may ask? Many blessings to you and your family. God’s peace. Hi Kay, It’s an honor to think of sharing breakfast time with you! 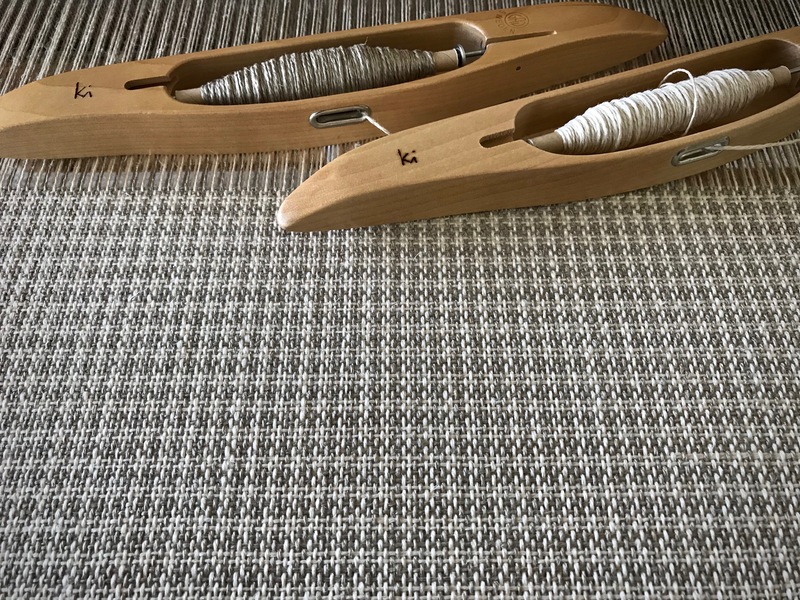 The double weave blanket is 8/2 cotton, warp and weft. The sett was 5 ends per cm (about 12 epi), each layer, which is a loose sett, almost gauzy. Congrats on the beautiful grandson! Enjoy your blog. Hi Linda, You are so sweet! I’m grateful to you. Congratulations to you and your family on Ari’s arrival! Babies bring their own welcome. Hi Annie, Ari did bring his own welcome. He has already made his way into our hearts! Wow, how can you think about anything else but Ari!!! What a beautiful boy! What a blessing for you and your family!! Hi Liberty, I don’t live in the same city as Ari, otherwise I would be cooing over him instead of sitting at the loom. 🙂 He is a good-lookin’ baby boy, that’s for sure. I’m pretty biased, as I should be. Thanks for sharing your sentiments! WOW too cute Karen, what a joy! Congratulations. Love that God sees each new Christian with the same joy. I love the blanket around Ari. Hi Betty, Yes, what a wonderful thought… that God welcomes each trust-er in Jesus as a new family member. The blanket suits Ari pretty well. I love all your pics including that cute baby. Makes you want to kiss those cheeks off. Hi Cynthi, Babies are like that. Very cuddly and kissable! Congratulations to your family on the new arrival! I noticed the double lease sticks and was wondering why you used them double. I’ve never seen that before. Is there an advantage? Special circumstance that benefits from them? Thanks in advance. Hi Theo, Thanks! Good eye to notice the double lease sticks. I mention the subject in this post: Simpler Warp Stripes. 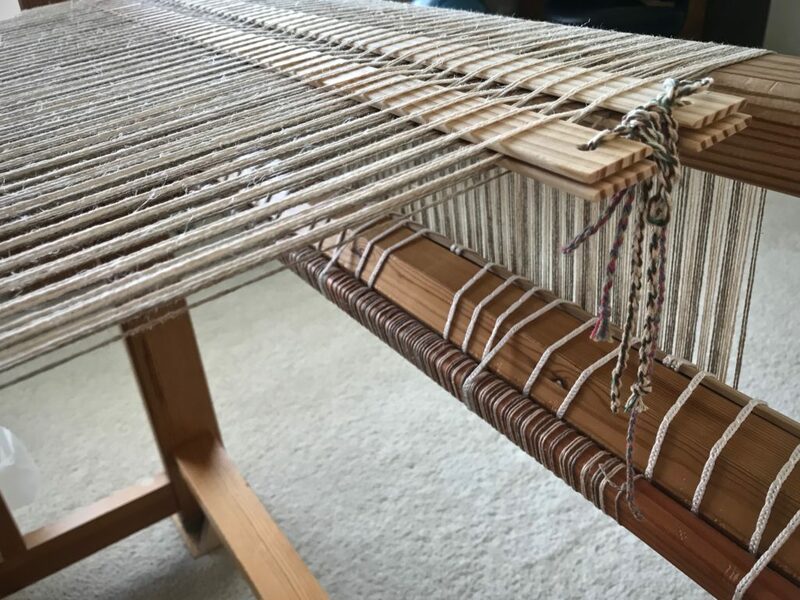 Basically, I had two separate warp chains, each with their own lease sticks, in order to put narrow stripes on the loom without having to cut and tie all the color changes while winding the warp.